Join us for prizes, contests, food, and fun! 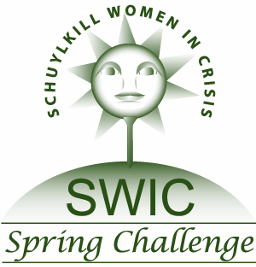 The 23rd Annual SWiC Spring Challenge promises to be the best ever! Don't miss out on a great time and show your support for services that help victims in transforming - sometimes saving - their lives. Schuylkill Women in Crisis, P.O.Box 96, Pottsville, PA 17901 or call Janel at 570.622.3991. Thank you for your donation to ! We're excited and honored that you've chosen to support us with a gift today. To make an even bigger impact, spread the word! Tell your community why you support ! by sending an email or sharing your support on social media. If you have any questions, feel free to contact us at or call . On behalf of all of us at SWiC, and the women, men, and children we serve, our sincere thanks for your support!